Showing results for tags 'british armed forces'. UNITED KINGDOM SPECIAL FORCES A BRITISH ARMED FORCES MODIFICATION CREATED BY JOINT FORCES COMMAND G8 STAFF WHAT ARE YOU MAKING? We are making a single source British special forces pack bringing equipment, weapons and other kit used by UKSF elements during the 2016-2020 timeframe. The mod will be dependent on 3 Commando Brigade's Weapons mod. The estimated/planned list of items and features for our initial release: Equipment: Ops Core FAST Maritime Ballistic Helmet L3 PVS-31A BNVD 3M Peltor Comtac XPI Small Arms: L119A1 10" L119A1 16" L119A2 10" L119A2 16" Small Arm Accessories: SureFire FA556-212 SureFire FH556-212A SureFire FH556-216A SureFire SOCOM556-RC2 SureFire SF3P-556-1/2-28 SureFire 556 BSD WHEN WILL YOUR MOD BE RELEASED? They will be released when we are satisfied enough with the amount and quality of content prior to release. CAN YOU MAKE-? We currently are not taking any requests as we have already established what we intend to create, anything else happens when it happens. HOW CAN I HELP? If you have skills that can aide in the development of the mod such as: modeling, config writing, and texturing; or if you are a member of the armed forces who wishes to advise submit a private message to myself, or contact N.Home or S.Greer on our teamspeak at: TS.JFCHQ.UK. We are especially looking for a 3D artist comfortable with soft surface modeling, and a second config writer. Who are we? Number 2 Company of the Coldstream Guards was created on the 2nd of April, 2018. We are a semi-realistic British milsim unit that operates in modern times. Since the Coldstream Guards are a Light Infantry unit, most of our events consist of maneuvers on foot at a Section-level although if we need to cross long distances or get somewhere quickly, we utilize lightly-armoured vehicles for transport such as Coyotes, Jackals and MRAPs. Event Information We conduct 4 types of events in No. 2 Coy, C. GDS. These are: Field Training Exercises (FTXs) Trainings Standalone Operations Campaign Operations Our events start at 7PM EST and can last anywhere from 1 hour - 3 hours depending on the type of event. We will give appropriate notice if the event will last a while. Structure of the Unit The Coldstream Guards are one of the Foot Guard Regiments of the British Army and is the oldest regiment in the Regular Army that is still in active service. Although we are technically underneath 1st Battalion of the Coldstream Guards, in reality there is only a single battalion anyways so we took that out of the equation when naming our unit. Our long-term goal is to grow and fill up an entire company and have linked support assets working alongside our guys on the ground. Although it may take a while to ever get to that stage, we are confident that with the right people helping organise and lead the unit, we can get there. Everyone has a part to play! Available Roles Since we are a brand new unit, we doubt they'll be pilot slots or sniper positions opening up anytime soon. That being said, there are plenty of infantry-based roles that might interest you: Rifleman Grenadier (Underslung Grenade Launcher) Pointman (CQB) Marksman (7.62mm Designated Marksman Rifle) Light Machine Gunner (5.56mm belt-fed Machine Gun) Medium Machine Gunner (7.62mm belt-fed Machine Gun) Junior NCO Positions (Cpl. and below) Senior NCO Positions (Sgt. and above) Signaller (Communications) Medic For those of you that enjoy helping units stay organised and would like to get into the admin side of things, once you've been in the unit for a couple weeks and have shown a good level of commitment and loyalty, we can look into getting you incorporated into our admin staff. Recruitment Process If you would like to join the unit, please contact one of our Recruitment Officers or comment below and we'll get in touch with you ASAP. (Please see bottom of the post for a list of our Command Staff and Recruitment Staff) Once contact has been made, we will answer any questions you might have and get you to fill out an application form. This gives us a good basis of what kind of person you are. After that, you will go through a quick 2-3 minute interview where we will ask you some standard questions and all you have to do is answer them to the best of your ability. Finally, you'll be tagged up on Steam, asked to start getting the mods downloaded, invited to the Steam group and voila, you're now a member of Number 2 Company of the Coldstream Guards! Command Staff & Recruitment Officers LSgt. L. Martin - Command Staff Section IC of 1 Section, 1 Platoon Steam Link | http://steamcommunity.com/id/BritanniaRulesTheWaves/ LCpl. H. MacLean - Command Staff Section 2IC of 1 Section, 1 Platoon Steam Link | https://steamcommunity.com/id/Hekkie/ Gdsm. O. Drakard - Recruitment Officer Steam Link | https://steamcommunity.com/id/Rainbow_Hedgehog_Guy_FCNR/ Gdsm. M. Moore - Recruitment Officer Steam Link | https://steamcommunity.com/id/Mayze6/ Gdsm. A. Handley - Recruitment Officer Steam Link | https://steamcommunity.com/id/sonicwildcatz/ Gdsm. D. Weeber - Recruitment Officer Steam Link | https://steamcommunity.com/profiles/76561198015369964/ Additional Information Steam Group - https://steamcommunity.com/groups/no2coycgds TeamSpeak 3 IP - 149.56.235.99 Thank you for reading, we hope to see you soon! After a 14 year break from releasing an addon, I'm giving it a new shot. 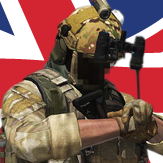 Helping fill out the British armed forces faction with the CVRT Scimitar and Scorpion. Light tanks designed and deployed in the 60s/70s, the CVRT range is an interesting anomaly in the history of armoured vehicles: light, fast and roadworthy. Scorpion had a 76mm gun, Scimitar the 30mm rarden cannon. Scimitar is being replaced by Ajax/Scout SV and RWMIK over the next couple years and Scorpion dissapeared in the 90s, but these still seem like the perfect class of vehicle for the armaverse: Not totally impervious and steamroll capable like Challenger 2, but more than handy in an infantry support role or zipping around Altis as formation recce. Planning to cover different variations from its timeline, but probably will hold off on Scimitar 2 (a UOR that mated Scimitar turret with Samson APC hull to add more IED protection and ECM gubbins) unless I get around to making CVRT Samson to the level of detail it deserves. Similarly, not gonna bother with CVRT Sabre (Fox armoured car turret on the CVRT hull). On the cards: different hidden selections, camo options, markings and potentially some OPFOR faction variations for Scorpion in particular - it got shipped around the world. Progress on variations: Early cold war era Scorpion with wading screens and old style engine deck. Perfect for Germany, Norway, defending the homeland and the Falklands deployment. Mid life gulf war era Scimitar with IR plates, storage and other gubbins slapped on in the attempt to fit into the harsh desert environ and keeping up with the combined arms battle space. Late life uparmoured Scimitar. A diesel engine upgrade and Thermal Imaging extended the lifespan and capability of the tank far into our recent incursions in the middle east. Bar armour and ECM will also be an option.